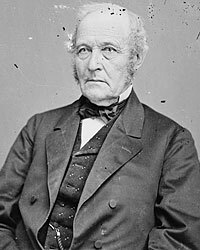 Vermont Senator (1854-1865) Jacob Collamer had a long career in Vermont politics – as a State Supreme Court Justice (1833-1842, 1850-1854) and Congressman (Whig, 1842-1859). He also served briefly as U.S. Postmaster General (1849-1850). Collamer made an early effort to influence President-elect Lincoln, writing him in January 1861: “My official position is holden on the expectation & intention of being a supporter of your Administration, & I therefore feel a deep interest as to the composition of your Cabinet, on your own account & for the public interest, as well as to insure cordiality in my duty. This must be my apology for this intrusion of an unasked opinion. I understand that Mr. Seward & Mr. Bates have been definitely selected for positions in the Cabinet. Rumor reports some others not so satisfactory. Now Dear Sir, permit me respectfully to solicit you to make no other appointments but the two first named, until your friends here, whom you regard as reliable & on whose positions you rely for cordial support, may be, by you, consulted, at least so far as to ascertain whether they entertain any reasonable objections.”2 Collamer’s subsequent relations with President Lincoln were more problematic. 1st. The only course of sustaining this government and restoring and preserving national existence, and perpetuating the national integrity, is by a vigorous and successful prosecution of the war, the same being a patriotic and just war on the part of this nation, produced by and rendered necessary to suppress a causeless and atrocious rebellion. 2d. The theory of our government, and the early and uniform political construction thereof is, that the President should be aided by a Cabinet council, agreeing with him in political principles and general policy, and that all important public measures and appointments should be the result of their combined wisdom and deliberation. This most obviously necessary condition of things, without which no administration can succeed, we and the public believe does not now exist, and therefore such selections and changes in its members should be made as will secure to the country unity of purpose and action, in all material and essential respects, more especially in the present crisis of public affairs. 3d. The Cabinet should be exclusively composed of statesmen who are the cordial, resolute, unwavering supporters of the principles and purposes first above stated. 4th. It is unwise and unsafe to commit the direction, conduct, or execution of any important military operation or separate general command or enterprise in this war to any one who is not a cordial believer and supporter of the same principles and purposes first above stated. At the meeting last evening there were present of the committee Senators Collamer, Fessenden, Harris, Trumbull, Grimes, Howard, Sumner, and Pomeroy. Wade was absent. The President and all the Cabinet but Seward were present. The subject was opened by the President, who read the resolutions and stated the substance of his interviews with the committee – their object and purpose. He spoke of the unity of his Cabinet, and how, though they could not be expected to think and speak alike on all subjects, all had acquiesced in measures when once decided. The necessities of the times, he said, had prevented frequent and long sessions of the Cabinet, and the submission of every question at the meetings. Secretary Chase indorsed the President’s statement fully and entirely, but regretted that there was not a more full and thorough consideration and canvass of every important measure in open Cabinet. Senator Collamer, the chairman of the committee, succeeded the President and calmly and fairly presented the views of the committee and of those whom they represented. They wanted united counsels, combined wisdom, and energetic action. If there is truth in the maxim that in a multitude of counselors there is safety, it might be well that those advisers who were near the President and selected by him, and all of whom were more or less responsible, should be consulted on the great questions which affected the national welfare, and that the ear of the Executive should be open to all and that he should have the minds of all. Senator Fessenden was skillful but a little tart; felt, it could be seen, more than he cared to say; wanted the whole Cabinet to consider and decide great questions, and that no one in particular should absorb and direct the whole Executive action. Spoke of a remark which he had heard from J.Q. Adams on the floor of Congress in regard to a measure of his administration. Mr. Adams said the measure was adopted against his wishes and opinion, but he was outvoted by Mr. Clay and others. He wished an administration so conducted. Grimes, Sumner and Trumbull were pointed, emphatic, and unequivocal in their opposition to Mr. Seward, whose zeal and sincerity in this conflict they doubted; each was unrelenting and unforgiving. Blair spoke earnestly and well. Sustained the President, and dissented most decidedly from the idea of a plural Executive; claimed that the President was accountable for his administration, might ask opinions or not of either and as many as he pleased, of all or none, of his Cabinet. Mr. Bates took much the same view. The President managed his own case, speaking freely, and showed great tact, shrewdness, and ability, provided such a subject were a proper one for such a meeting and discussion. I have no doubt he considered it most judicious to conciliate the Senators with respectful deference, whatever may have been his opinion of their interference. 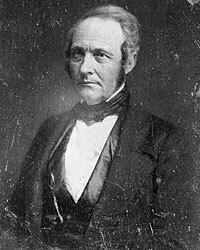 When he closed his remarks, he said it would be a gratification to him if each member of the committee would state whether he now thought it advisable to dismiss Mr. Seward, and whether his exclusion would strengthen or weaken the Administration and the Union cause in their respective States. Grimes, Trumbull, and Sumner, who had expressed themselves decided against the continuance of Mr. Seward in the Cabinet, indicated no change of opinion. Collamer and Fessenden declined committing themselves on the subject; had in their action the welfare of the whole country in view; were not prepared to answer the questions. Senator Harris felt it a duty to say that while many of the friends of the Administration would be gratified, others would feel deeply wounded, and the effect of Mr. Seward’s retirement would, on the whole, be calamitous in the State of New York. Pomeroy of Kansas said, personally, he believed the withdrawal of Mr. Seward would be a good movement and he sincerely wished it might take place. Howard of Michigan declined answering the question. During the discussion, the volume of diplomatic correspondence, recently published, was alluded to; some letters denounced as unwise and impolitic were specified, one of which, a confidential dispatch to Mr. Adams, was read. If it was unwise to write, it was certainly injudicious and indiscreet to publish such a document. Mr. Seward has genius and talent, – no one better knows it than himself, – but for one in his place he is often wanting in careful discrimination, true wisdom, sound judgment, and discreet statesmanship. The committee believe he thinks more of the glorification of Seward than the welfare of the country. He wishes the glorification of both and believes he is the man to accomplish it, but has unwittingly and unwarily begotten and brought on the part of Senators, by his endeavors to impress them and others with the belief that the is the Administration. It is a mistake; the Senators dislike,–have measure and know him. Allan G. Bogue, The Earnest Men: Republicans of the Civil War Senate, p. 32. Abraham Lincoln Papers at the Library of Congress. Transcribed and Annotated by the Lincoln Studies Center, Knox College, Galesburg, Illinois (Letter from Jacob Collamer to Abraham Lincoln, January 2, 1861). Fessenden, Life and Public Services of William Pitt Fessenden, p. 233. Fessenden, Life and Public Services of William Pitt Fessenden, p. 238. Gideon Welles, Diary of Gideon Welles, Volume I, pp. 196-200. Abraham Lincoln Papers at the Library of Congress. Transcribed and Annotated by the Lincoln Studies Center, Knox College. Galesburg, Illinois (Letter from Jacob Collamer to Abraham Lincoln, Sunday, January 20, 1861).